The Murphy/Smith Dance Collective celebrates a century of women's social progress. "It is more a mirror on society rather than any political statement." Murphy/Smith Dance Collective's Laura Warnock, Jamie Erin Murphy and Renee Danielle Smith. 8 p.m. Fri., Dec. 7. The line is from "The Good Wife's Guide," a widely circulated list attributed to a 1950s women's magazine. Though the list itself is likely apocryphal, it reflects that era's gender norms. And for choreographers Jamie Erin Murphy and Renee Danielle Smith, artistic directors of Murphy/Smith Dance Collective, such notions are just one aspect of the journey women have taken over the past century. 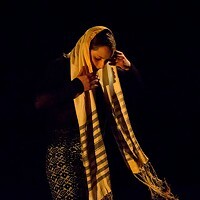 It's a journey they chronicle in I Am Woman, premiering Dec. 7 at the Pittsburgh Dance Center. Point Park University graduates Murphy and Smith describe the 40-minute multimedia work as a "sequential visual storybook" from women's suffrage in the 1920s through today. Set to a range of music — including feminist anthems "The Pill," by Loretta Lynn, Lesley Gore's "You Don't Own Me," and Helen Reddy's "I Am Woman" — the work delves into "the different stereotypes of women over time, including how women have gone from having to be housewives to being in the workplace," says Murphy. It also touches on themes of women's empowerment, sexuality and body-image issues. In addition to "The Good Wife's Guide," Murphy and Smith say I Am Woman was inspired by literature and speeches, personal stories and videos found on YouTube — including a clip in which a current-day evangelist preacher explains why women shouldn't wear pants, and how doing so confuses gender roles. 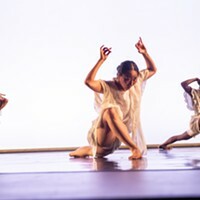 Danced by a cast of seven including Murphy and Smith, I Am Woman features choreography infused with movement reflecting styles from the different eras. Both Murphy and Smith say that they are grateful for how far things have come for women, and that their work is not a gripe session about challenges that remain. "It is more a mirror on society rather than any political statement," says Smith. The work also reflects Murphy/Smith Dance Collective's evolution as a company. Since its founding in 2011, it's done mostly smaller works, but now is looking toward larger projects, say Murphy and Smith. In addition to I Am Woman, the Dec. 7 program includes three short works, by independent artists Beth Ratas, Taylor Knight and Laura Warnock.